A new CEO and minimized losses out of Texas may add more momentum to a mild share price recovery year to date. New CEO Bernard Acoca, who took over leadership of the company in March from retiring CEO Steve Sather, will try to build on this small but significant momentum. A Starbucks Corporation (NASDAQ:SBUX) veteran, Acoca served for the last two-and-a-half years as president of Starbucks' global tea business, Teavana, where he oversaw retail store expansion as well as the growth of the division's e-commerce business. Before Teavana, Acoca worked in senior marketing positions in Starbucks' "Americas" segment, served as chief marketing officer of beauty conglomerate L'Oreal, and spent ten years in marketing at global quick-service giant Yum! Brands. In short, the new CEO possesses a variety of skills and much experience that will be useful in righting El Pollo Loco's fortunes. He's wasting little time. During his first earnings conference call in early May, Acoca outlined three new areas of strategic focus for El Pollo Loco: "[N]umber one, develop the people-first culture; two, differentiate the brand; and three, grow the business." Acoca elaborated on these concepts as follows. A people-first culture entails investing in and expanding talent, while reinforcing values that will enable employees to "lead others with authenticity, transparency, humility and service." Brand differentiation includes positioning El Pollo Loco as the No. 1 fast-causal chicken chain, communicating the brand's healthy, "better for you" credentials, articulating and promoting El Pollo Loco's Hispanic heritage, and delivering next-level customer service. Expanding the business translates to adding new locations responsibly and thoughtfully. 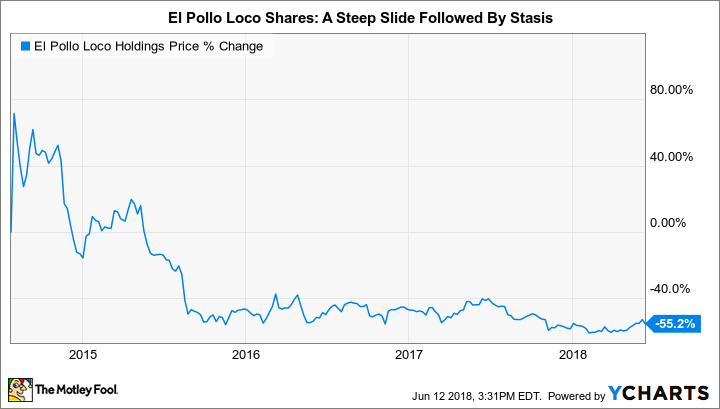 Ill-conceived and aggressive expansion into Texas, outside of the company's home-base state of California, was one of the precipitating factors in El Pollo Loco's stock malaise over the last three years. Alternatively, Acoca relayed that a "customer-centric" strategy would now determine unit expansion. In other words, the company is likely to follow demand to determine geographic expansion areas, and at the least, conduct much more intensive market and demographic research before adding new metropolitan statistical areas (MSAs) to El Pollo Loco's development map. Image source: El Pollo Loco, Inc.
Of the three foundational strategies above, I'm most intrigued by Acoca's plans for revitalizing and propagating the Loco brand. Establishing itself as the nation's preeminent chicken chain isn't the stretch goal it might seem: El Pollo Loco, for all of its share woes, still wows customers as a restaurant concept. As Acoca pointed out in his conference call, and as my colleague Dan Kline reported on this spring, El Pollo Loco tied for third place with Zaxby's in the chicken category in Market Force Information's 2018 edition of its large-scale, nationwide survey on quick-service dining options. Even more impressively, Loco came in second -- by one-tenth of 1% -- behind a resurgent Chipotle Mexican Grill in the Mexican food category. The inference for El Pollo Loco management, and shareholders, is that the company's franchise concept still very much has legs and can potentially be rejuvenated -- given the right execution. Focusing on Loco's relatively healthy menu as a better-for-you option, while acknowledging and celebrating the chain's Hispanic roots, appear to be shrewd tactics. El Pollo Loco can attract both the legions of health-conscious consumers and the burgeoning Hispanic demographic in the company's concentrated southern California base -- especially where these populations intersect. You can see the benefit of Acoca's experience at Starbucks, as he's zeroed in on brand differentiators around which a highly effective marketing campaign can be constructed. On the surface, El Pollo Loco's near-term is still quite ambiguous. Systemwide comparable-restaurant sales are projected to be flat this year. Expected restaurant margin (revenue less direct restaurant expenses including food, labor, and occupancy) of between 18.7% and 19.3% will remain below an average margin of 20.7% over the last three years. However, the company continues to minimize its losses in Texas. In the first quarter of 2018, El Pollo Loco closed two more restaurants in the Lone Star State, leaving 17 corporate-owned stores, all of which have previously been written down as impaired (franchisees operate an additional 20 units in the state). Stabilization in this geographic region, coupled with even a modest recovery in overall company revenue, could push El Pollo Loco's 2018 results beyond current flattish guidance. More persuasively, as the company hits the reset button under a new CEO, it's still undervalued relative to the broader market. El Pollo Loco currently trades at 15 times forward earnings, versus an average of nearly 25 times forward earnings for the Russell 2000 Index, a widely followed benchmark for small-capitalization stocks. The longer your investing horizon, the more attractive these shares look.